Fighting Irish Thomas: Give me liberty or give me Obamacare! Jindal soars in "The Silent War on Religious Liberty"
Give me liberty or give me Obamacare! Jindal soars in "The Silent War on Religious Liberty"
America does not sustain and create faith. Faith created and sustains America. -Gov. Bobby Jindal, "The Silent War on Religious Liberty"
The President is very concerned about religious liberty…and also, if you like your religion you can keep your religion. -Gov. 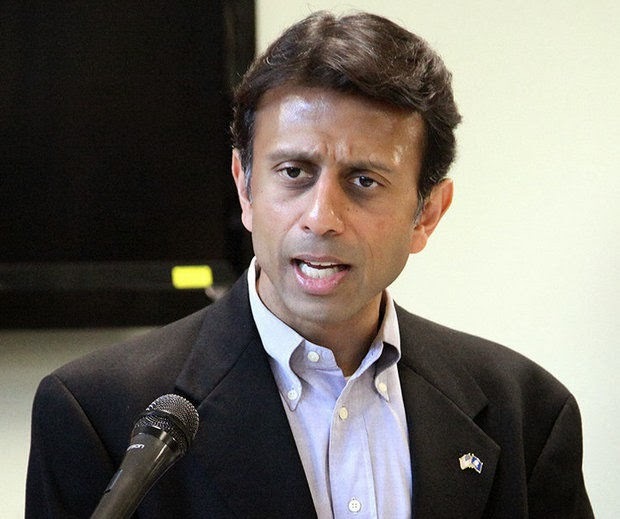 Bobby Jindal, "The Silent War on Religious Liberty"
In a surprise move, Gov. Bobby Jindal spoke little about the failing economy and much about religious liberty in his speech at the Ronald Reagan Presidential Foundation and Library Thursday night. But by boldly stating, "The modern left in America is completely intolerant of the views of people of faith. They want a completely secular society where people of faith keep their views to themselves," Jindal has not only thrown down the gauntlet to the left, but made himself the 2016 favorite for the Republican presidential nomination to the religious right–if he indeed accepts their great "commission." After recalling Margaret Thatcher's famous quote, "Europe was created by history. America was created by philosophy," Jindal details the stunningly swift success that America's "secular elites" have had in changing America from a God-centered to government-centered society, so much so that the "vision of America is not the vision of the Founding. It’s not even the vision of ten years ago." Although Jindal does not tackle the struggle of my beloved Notre Dame against Obamacare, he does mention the heroic fight of Hobby Lobby, a company that started with $600 and a garage, and now has over 600 stores, 14,000 full-time staff, who, instead of being praised by Obama as "entrepreneurship at its best," as Jindal does, is threatened with bankruptcy by the imposing fines of "$1.3 million per day if they didn’t pay [against their religion] for abortifacients through their insurance," to their employees. Still, Jindal proclaims the Hobby Lobby ruling or that against Elane Photography, where the judge ruled these Christian photographers must "compromise the very religious beliefs that inspire their lives,” because that was “the price of citizenship," is nowhere as chilling as the one the Obama Administration has (yet) to get away with. Barack and his Christian-bashing buddies overstepped (for the time being) their bounds in the Hosanna-Tabor case. As Jindal dryly noted in this case where a teacher was fired (only to be reinstated by a lower court), for teaching dogma directly against those held by the Christian school, "[y]ou have to take a pretty extreme position for Elena Kagan to join with Samuel Alito on an opinion." The fact that the administration THOUGHT they could get away with a legal argument that bluntly stated, "religious groups don’t even have the Constitutionally protected right to select their own ministers or rabbis," is both amazing and at the same time, a preview of what, under liberal watch, our United States will soon become. To be clear, Jindal concludes that, "churches in America are not being burned to the ground, and Christians are not being slaughtered for their faith"–yet. But to also be clear to all the Reaganites in both the real and virtual audience, Bobby J left them with a quote by Ronnie R himself, "Freedom is a fragile thing and is never more than one generation away from extinction. It is not ours by inheritance; it must be fought for and defended constantly by each generation," which perfectly echoed Jindal's theme about how quickly our religious liberties are being lost–and how quickly we must act to win them back. Jindal then declares that every American who values faith or freedom must fight against our current liberal government's war on religious liberty, for although Obama (perhaps after being tipped off to Jindal's upcoming speech) recently "waxed eloquently" on the topic of religious liberty too, Jindal's sarcastic paraphrase of Barack's Obamacare gaffe, "if you like your religion you can keep your religion," demonstrates Obama is about as trustworthy on this issue as he was on health care. And speaking of "the fight," the "window for Jindal" and like-minded politicians in our country may soon be closing, and I pray that Bobby J will soon take up the uphill fight for religious liberty by running for the presidency of the United States–and I hope that he and many other faithful Americans feel the same.